Quinoa (keen-wah). If you haven’t tried it, you really should give it shot. It’s a pseudocereal with a slightly nutty flavor, which makes it a great alternative to rice. Quinoa is extremely nutritious and has a very high protein content (12%–18%), making it a healthy choice for vegetarians, vegans and athletes. Unlike wheat or rice, which is low in lysine, quinoa contains a balanced set of essential amino acids, making it an unusually complete protein source. And the best part about it is…it tastes great! For this recipe, we prepared it like you would rice and mixed it with sautéed vegetables and caramelized onions for a quick, delicious healthy meal. 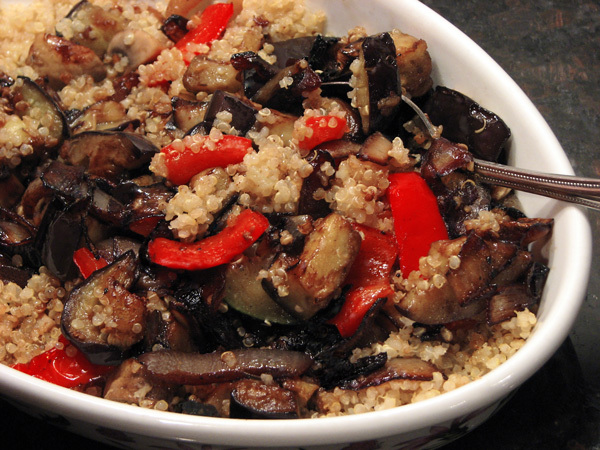 You can use any vegetables you like in this dish…everything seems to go well with quinoa and you can find it just about anywhere these days…Nature’s Earthly Choice is a great brand. Please click here for a printable recipe.